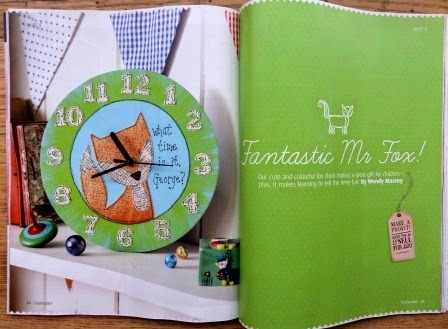 Well, the fox clock I showed you a peek of a while back is in the latest Craftseller magazine (issue 37, in the shops 8th May) - I love the colours in this one. It's always good to see a project professionally photographed, too. 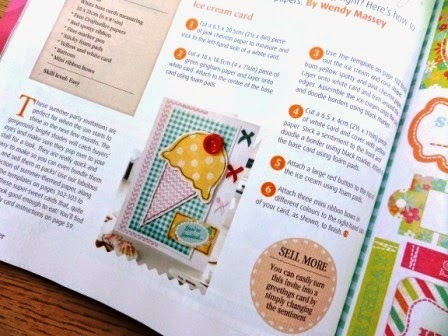 And in the same issue are a couple of my cards, made with their free papers - very summery! not sure why he was licking his lips, but I love the picture! 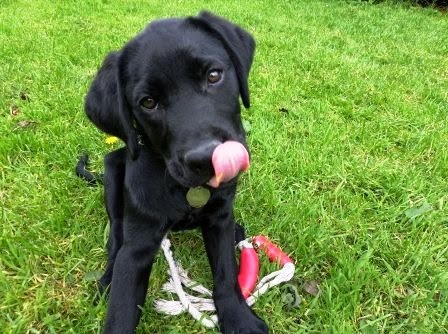 Guide dog puppy Quentin is still doing well, although the puppy classes we go to are a bit of a wake up call for me - the perfect sit, wait, and down he does at home all become much less perfect when he's surrounded by other puppies and in a strange environment! Still, it's all good practice! I've realised the toys I've bought for him are generally much less robust than the toys I've made for him, so with that in mind I'm planning to make a few more! The first ones I made were put together in a matter of minutes from old jeans - the one in the picture above is his favourite, which is just two denim plaits joined to a square of denim in the middle. Really simple, but he loves it - it's great for tugging, running around, chasing and just chewing. And it's more robust than any of the rope tug toys I've bought. So there will definitely be more of the handmade toys to come. I need to put together some patterns and tutorials, too, I think. If you've not already visited the blog this week, you'll have missed the news that Handmade Harbour now has a Facebook group - click the link to visit and join. It's a space for you to share your own makes, as well as get news about Handmade Harbour's digital stamps and sewing patterns. A big thank you to Martha for kindly setting up the page for us! Over to you now for Handmade Monday! Congrats on having your beautiful creations featured in the magazine. Quentin looks as cute as ever! Your magazine articles look great as usual. Our dog used to have a pink hippo toy that he liked to de-stuff. 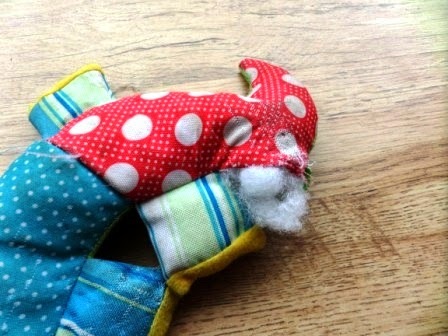 He got so much fun out of doing it that we would simply push the stuffing back in for him to pull out again! Now lets see if I can just post one comment this week :-) Facebook page is a great idea, I've joined and shared, so some of my friends have joined too. Oooh i love your foxy clock! The colours are fab, it would be really fun in a kitchen i think. 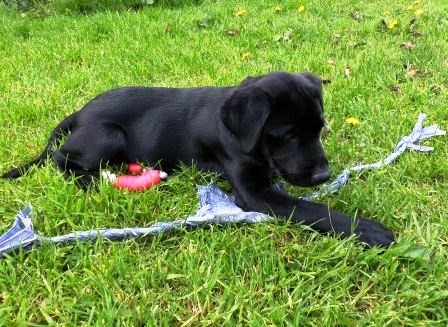 Oh, I do have a bit of a soft spot for black labs! Lovely makes that you have done and in the magazine. Foxy is going to be a hit. Quentin is a little cutie. That clock is awesome! I love it! Can't believe Quentin is so big already! Have a good week. Your foxy clock is gorgeous, and I love the ice cream card too. Glad to see Quentin is enjoying his toys. Quentin is gorgeous, my brother has a golden lab and his reason for life seems to be destroying cuddly toys - but only those he is given, he leaves other people's cuddlies well alone! Your fox clock looks lovely. Can't wait to get my hands on the magazine.